If economic conditions pushed you into filing for Chapter 13 bankruptcy protection, that need not keep you from buying a house. Eight important factors on filing for a Chapter 13 Bankruptcy. 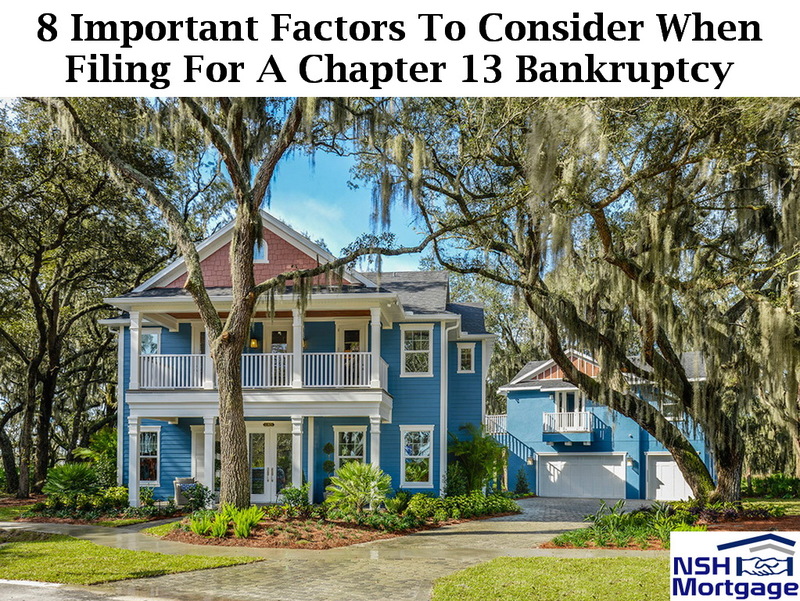 NSH Mortgage has the knowledge and tools to help you file for a Chapter 13 Bankruptcy. You can get a mortgage with a Chapter 13 bankruptcy, sometimes even while you are still in the plan and making your payments. Today, filing for bankruptcy is not usually a financial death sentence. Often, mortgage lenders will say yes to your loan application whilst you are still working through a Chapter 13. For some loan programs, you may need to wait a year or two after you file to qualify for a mortgage. Bankruptcy is a constitutional right that is designed to help you get a fresh start following a financial disaster. According to a New York Federal Reserve Bank study, people who file for bankruptcy. Get through the ordeal in better financial shape. In addition, they receive less damage to their credit scores than those in similar financial stress who don’t file for bankruptcy. Bankruptcy has a harsh immediate impact, but the long term result of bankruptcy on filers’ credit scores are positive. About 60 points higher than that of consumers in financial distress who choose not to file for bankruptcy. The chart below shows the difference in credit scores of insolvent broke individuals who filed or did not file bankruptcy. 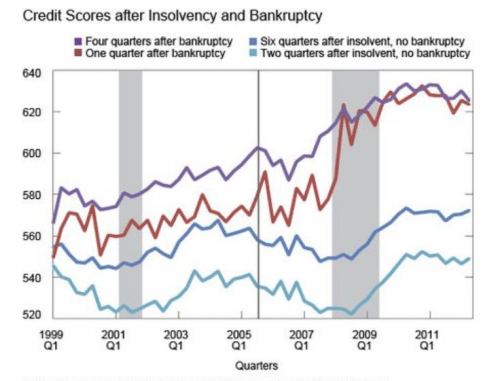 You can see that the bankrupt consumers recovered much more quickly than the non-filers. Bankruptcy law is divided into chapters. Most consumers file either a Chapter 7 bankruptcy, which discharges all qualifying debts immediately. Or a Chapter 13, which sets up a 3 – 5 year payment plan to repay some or all their debt. Most mortgage lenders look more favorably on applicants who file Chapter 13 than those who file for Chapter 7. That is because Chapter 13 filers have made an effort to repay at least some part of their debts. In fact, some mortgage lenders treat a Chapter 13 filing the same way that they would consider a debt management plan through a credit counseling service. As evidence that you are trying to fix your finances and fly right. Credit reporting agencies favor people who file a Chapter 13 over those who file for Chapter 7. A Chapter 7 appears on a credit report for up to ten years after the filing date. Whereas. a Chapter 13 must be removed in 7 years. Depending on the circumstances of your case, you may be able to qualify for a mortgage. While you are still working through a Chapter 13 plan. FHA, VA and USDA (Rural Housing) lending programs do approve borrowers who are in a court supervised payment plan. In addition, some alternative mortgage programs (called Non-QM, Alt-A or Non-Prime) offer home loans to people in Chapter 13 plans. You qualify for the loan under the program’s underwriting guidelines. At least 12 months of the repayment period must have elapsed, and you must have made all required payments on time. The Bankruptcy Trustee or a Bankruptcy Court judge will give you written approval to take out the loan. If you have completed your plan and meet program guidelines, no additional criteria apply to get approved for government backed mortgages. The Dodd-Frank Wall Street Reform and Consumer Protection Act of 2010 set standards for the least risky home loans. The Consumer Protection Act calls this qualified mortgages. There is no requirement that every loan meets the QM standard. Loans that do not are considered non-QM loans. They are riskier than QM loans. Lenders assume extra risks when they choose to fund these mortgages, and their costs are higher. But they may be appropriate if you want to borrow higher loan amounts or wait less time before borrowing. Expect to pay higher interest rates and fees for one of these mortgages. Filers who fail to complete the plan may have their bankruptcy dismissed. They probably still owe their creditors, and will have to wait for at least four years from the dismissal date. Filers with multiple bankruptcies in the seven years before applying will have to wait for at least seven years. A two year waiting period is permitted after a Chapter 13 dismissal, if extenuating circumstances can be documented. There are no exceptions permitted to the two year waiting period after a Chapter 13 discharge. For multiple bankruptcies, extenuating circumstances can get your waiting period cut to three years. What Are Extenuating Circumstances For Chapter 13 Mortgages? The producers of distinguished loan programs discover that people who file for a Chapter 13 do so for good and bad reasons. An example of a bad reason is mismanaging money, or put more simply, living above their means. Were the events beyond your control? Is the problem likely to happen again? Extenuating circumstances are nonrecurring events that are beyond the borrower’s control. That results from a sudden, significant, or prolonged decrease in income. Or a catastrophic increase in financial obligations. A critical illness or disability, a company layoff, or death of the primary wage earner would qualify as extenuating. Understand that these tests do not apply to every program. Discuss with several lenders about your circumstances. So you can learn when you qualify to apply for a loan following a chapter 13 discharge or dismissal.